A person with medication-induced dystonia. The disorder may be hereditary or caused by other factors such as birth-related or other physical trauma, infection, poisoning (e.g., lead poisoning) or reaction to pharmaceutical drugs, particularly neuroleptics, or stress. Treatment must be highly customized to the needs of the individual and may include oral medications, chemodenervation botulinum neurotoxin injections, physical therapy, or other supportive therapies, and surgical procedures such as deep brain stimulation. There are multiple types of dystonia, and many diseases and conditions may cause dystonia. Cause (which includes changes or damage to the nervous system and inheritance). Physicians use these classifications to guide diagnosis and treatment. Also known as torsion dystonia or idiopathic torsion dystonia (old terminology "dystonia musculorum deformans"). Oculogyric crisis muscles of eyes and head An extreme and sustained (usually) upward deviation of the eyes often with convergence causing diplopia(double vision). It is frequently associated with backward and lateral flexion of the neck and either widely opened mouth or jaw clenching. Frequently a result of antiemetics such as the neuroleptics (e.g., prochlorperazine) or metoclopramide. Can be caused by Chlorpromazine. Focal hand dystonia (also known as musician's or writer's cramp). single muscle or small group of muscles in the hand It interferes with activities such as writing or playing a musical instrument by causing involuntary muscular contractions. The condition is sometimes "task-specific," meaning that it is generally apparent during only certain activities. Focal hand dystonia is neurological in origin and is not due to normal fatigue. The loss of precise muscle control and continuous unintentional movement results in painful cramping and abnormal positioning that makes continued use of the affected body parts impossible. There is a group called myoclonic dystonia where some cases are hereditary and have been associated with a missense mutation in the dopamine-D2 receptor. Some of these cases have responded well to alcohol. Other genes that have been associated with dystonia include CIZ1, GNAL, ATP1A3, and PRRT2. Another report has linked THAP1 and SLC20A2 to dystonia. 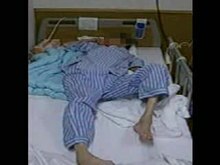 Hyperglycemia-induced involuntary movements, which, in this case, did not consist of typical hemiballismus but rather of hemichorea (dance-like movements of one side of the body; initial movements of the right arm in the video) and bilateral dystonia (slow muscle contraction in legs, chest, and right arm) in a 62-year-old Japanese woman with type 1 diabetes. Symptoms vary according to the kind of dystonia involved. In most cases, dystonia tends to lead to abnormal posturing, in particular on movement. Many sufferers have continuous pain, cramping, and relentless muscle spasms due to involuntary muscle movements. Other motor symptoms are possible including lip smacking. Early symptoms may include loss of precision muscle coordination (sometimes first manifested in declining penmanship, frequent small injuries to the hands, and dropped items), cramping pain with sustained use, and trembling. Significant muscle pain and cramping may result from very minor exertions like holding a book and turning pages. It may become difficult to find a comfortable position for arms and legs with even the minor exertions associated with holding arms crossed causing significant pain similar to restless leg syndrome. Affected persons may notice trembling in the diaphragm while breathing, or the need to place hands in pockets, under legs while sitting or under pillows while sleeping to keep them still and to reduce pain. Trembling in the jaw may be felt and heard while lying down, and the constant movement to avoid pain may result in the grinding and wearing down of teeth, or symptoms similar to temporomandibular joint disorder. The voice may crack frequently or become harsh, triggering frequent throat clearing. Swallowing can become difficult and accompanied by painful cramping. Direct symptoms may be accompanied by secondary effects of the continuous muscle and brain activity, including disturbed sleep patterns, exhaustion, mood swings, mental stress, difficulty concentrating, blurred vision, digestive problems, and short temper. People with dystonia may also become depressed and find great difficulty adapting their activities and livelihood to a progressing disability. Side-effects from treatment and medications can also present challenges in normal activities. An accurate diagnosis may be difficult because of the way the disorder manifests itself. Sufferers may be diagnosed as having similar and perhaps related disorders including Parkinson's disease, essential tremor, carpal tunnel syndrome, TMD, Tourette's syndrome, conversion disorder or other neuromuscular movement disorders. It has been found that the prevalence of dystonia is high in individuals with Huntington's disease, where the most common clinical presentations are internal shoulder rotation, sustained fist clenching, knee flexion, and foot inversion. Risk factors for increased dystonia in patients with Huntington's disease include long disease duration and use of antidopaminergic medication. Primary dystonia is suspected when the dystonia is the only sign and there is no identifiable cause or structural abnormality in the central nervous system. Researchers suspect it is caused by a pathology of the central nervous system, likely originating in those parts of the brain concerned with motor function—such as the basal ganglia and the GABA (gamma-aminobutyric acid) producing Purkinje neurons. The precise cause of primary dystonia is unknown. In many cases it may involve some genetic predisposition towards the disorder combined with environmental conditions. Secondary dystonia refers to dystonia brought on by some identified cause, such as head injury, drug side effect (e.g. tardive dystonia), or neurological disease (e.g. Wilson's disease). Meningitis and encephalitis caused by viral, bacterial, and fungal infections of the brain have been associated with dystonia. The main mechanism is inflammation of the blood vessels, causing restriction of blood flow to the basal ganglia. Other mechanisms include direct nerve injury by the organism or a toxin, or autoimmune mechanisms. Environmental and task-related factors are suspected to trigger the development of focal dystonias because they appear disproportionately in individuals who perform high precision hand movements such as musicians, engineers, architects, and artists. Chlorpromazine can also cause dystonia, which can be often misjudged as a seizure.Neuroleptic drugs often cause dystonia, including oculogyric crisis. pumps in the cerebellum (that act to corrupt its input to the basal ganglia) possibly in Purkinje neurons. Cerebellum issues causing dystonia is described by Filip et al. 2013: "Although dystonia has traditionally been regarded as a basal ganglia dysfunction, recent provocative evidence has emerged of cerebellar involvement in the pathophysiology of this enigmatic disease. It has been suggested that the cerebellum plays an important role in dystonia etiology, from neuroanatomical research of complex networks showing that the cerebellum is connected to a wide range of other central nervous system structures involved in movement control to animal models indicating that signs of dystonia are due to cerebellum dysfunction and completely disappear after cerebellectomy, and finally to clinical observations in secondary dystonia patients with various types of cerebellar lesions. It is proposed that dystonia is a large-scale dysfunction, involving not only cortico-basal ganglia-thalamo-cortical pathways, but the cortico-ponto-cerebello-thalamo-cortical loop as well. Even in the absence of traditional "cerebellar signs" in most dystonia patients, there are more subtle indications of cerebellar dysfunction. It is clear that as long as the cerebellum's role in dystonia genesis remains unexamined, it will be difficult to significantly improve the current standards of dystonia treatment or to provide curative treatment." Reducing the types of movements that trigger or worsen dystonic symptoms provides some relief, as does reducing stress, getting plenty of rest, moderate exercise, and relaxation techniques. Various treatments focus on sedating brain functions or blocking nerve communications with the muscles via drugs, neuro-suppression, or denervation. All current treatments have negative side-effects and risks. A geste antagoniste is a physical gesture or position (such as touching one's chin) that temporarily interrupts dystonia, it is also known as a sensory trick. Patients may be aware of the presence of a geste antagoniste that provides some relief. Therapy for dystonia can involve prosthetics that passively simulate the stimulation. While research in the area of effectiveness of physical therapy intervention for dystonia remains weak, there is reason to believe that rehabilitation can benefit dystonia patients. Physical therapy can be utilized to manage changes in balance, mobility and overall function that occur as a result of the disorder. A variety of treatment strategies can be employed to address the unique needs of each individual. Potential treatment interventions include splinting, therapeutic exercise, manual stretching, soft tissue and joint mobilization, postural training and bracing, neuromuscular electrical stimulation, constraint-induced movement therapy, activity and environmental modification, and gait training. A patient with dystonia may have significant challenges in activities of daily living (ADL), an area especially suited for treatment by occupational therapy (OT). An occupational therapist (OT) may perform needed upper extremity splinting, provide movement inhibitory techniques, train fine motor coordination, provide an assistive device, or teach alternative methods of activity performance to achieve a patient's goals for bathing, dressing, toileting, and other valued activities. Recent research has investigated further into the role of physiotherapy in the treatment of dystonia. A recent study showed that reducing psychological stress, in conjunction with exercise, is beneficial for reducing truncal dystonia in patients with Parkinson’s Disease. Another study emphasized progressive relaxation, isometric muscle endurance, dynamic strength, coordination, balance, and body perception, seeing significant improvements to patients’ quality of life after 4 weeks. Since the root of the problem is neurological, doctors have explored sensorimotor retraining activities to enable the brain to "rewire" itself and eliminate dystonic movements. The work of several doctors such as Nancy Byl and Joaquin Farias has shown that sensorimotor retraining activities and proprioceptive stimulation can induce neuroplasticity, making it possible for patients to recover substantial function that was lost due to Cervical Dystonia, hand dystonia, blepharospasm, oromandibular dystonia, dysphonia and musicians' dystonia. Due to the rare and variable nature of dystonia, research investigating the effectiveness of these treatments is limited. There is no gold standard for physiotherapy rehabilitation. To date, focal cervical dystonia has received the most research attention; however, study designs are poorly controlled and limited to small sample sizes. Different medications are tried in an effort to find a combination that is effective for a specific person. Not all people respond well to the same medications. Medications that have had positive results in some include: diphenhydramine, benzatropine and atropine. anti-Parkinsons agents (such as ropinirole and bromocriptine), and muscle relaxants (such as diazepam). Medications such as anticholinergics (benztropine), which act as inhibitors of the neurotransmitter acetylcholine, may provide some relief. In the case of an acute dystonic reaction, diphenhydramine is sometimes used (though this drug is well known as an antihistamine, in this context it is being used primarily for its anticholinergic role).. See also Procyclidine. Botulinum toxin injections into affected muscles have proved quite successful in providing some relief for around 3–6 months, depending on the kind of dystonia. Botox or Dysport injections have the advantage of ready availability (the same form is used for cosmetic surgery) and the effects are not permanent. There is a risk of temporary paralysis of the muscles being injected or the leaking of the toxin into adjacent muscle groups, causing weakness or paralysis in them. The injections must be repeated, as the effects wear off and around 15% of recipients develop immunity to the toxin. There is a Type A and a Type B toxin approved for treatment of dystonia; often, those that develop resistance to Type A may be able to use Type B.
Clonazepam, an anti-seizure medicine, is also sometimes prescribed. However, for most, their effects are limited and side-effects like mental confusion, sedation, mood swings, and short-term memory loss occur. Surgery, such as the denervation of selected muscles, may also provide some relief; however, the destruction of nerves in the limbs or brain is not reversible and should be considered only in the most extreme cases. Recently, the procedure of deep brain stimulation (DBS) has proven successful in a number of cases of severe generalised dystonia. DBS as treatment for medication-refractory dystonia, on the other hand, may increase the risk of suicide in patients. However, reference data of patients without DBS therapy are lacking. The Italian Bernardino Ramazzini provided one of the first descriptions of task-specific dystonia in 1713 in a book of occupational diseases, The Morbis Artificum. In chapter II of this book’s Supplementum, Ramazzini noted that “Scribes and Notaries” may develop “incessant movement of the hand, always in the same direction … the continuous and almost tonic strain on the muscles... that results in failure of power in the right hand.” A report from the British Civil Service also contained an early description of writer’s cramp. In 1864, Solly coined the term “scrivener’s palsy” for this affliction. These historical reports usually attributed the etiology of the motor abnormalities to overuse. Then, dystonia were reported in detail in 1911, when Hermann Oppenheim, Edward Flatau and Wladyslaw Sterling described some Jewish children affected by a syndrome that was retrospectively considered to represent familial cases of DYT1 dystonia. Some decades later, in 1975, the first international conference on dystonia was held in New York. It was then recognized that, in addition to severe generalized forms, the dystonia phenotype also encompasses poorly-progressive focal and segmental cases with onset in adulthood, such as blepharospasm, torticollis and writer’s cramp. These forms were previously considered independent disorders and were mainly classified among neuroses. A modern definition of dystonia was worded some years later, in 1984. During the following years it became evident that dystonia syndromes are numerous and diversified, new terminological descriptors (e.g., dystonia plus, heredodegenerative dystonias, etc.) and additional classification schemes were introduced. The clinical complexity of dystonia was then fully recognized. ^ a b "Dystonias Fact Sheet - National Institute of Neurological Disorders and Stroke". www.ninds.nih.gov. Archived from the original on 23 April 2018. Retrieved 2 May 2018. ^ a b Balint, Bettina; Bhatia, Kailash P. (2014). "Dystonia". Current Opinion in Neurology. 27 (4): 468–76. doi:10.1097/WCO.0000000000000114. PMID 24978640. ^ Colleen M Hayes. "Down on the Pharm': All About Acute Dystonic Reaction". EMSvillage.com. Archived from the original on 15 November 2006. ^ Hersheson, Joshua; Mencacci, Niccolo E.; Davis, Mary; MacDonald, Nicola; Trabzuni, Daniah; Ryten, Mina; Pittman, Alan; Paudel, Reema; Kara, Eleanna; Fawcett, Katherine; Plagnol, Vincent; Bhatia, Kailash P.; Medlar, Alan J.; Stanescu, Horia C.; Hardy, John; Kleta, Robert; Wood, Nicholas W.; Houlden, Henry (2013). "Mutations in the autoregulatory domain of β-tubulin 4a cause hereditary dystonia". Annals of Neurology. 73 (4): 546–53. doi:10.1002/ana.23832. PMC 3698699. PMID 23424103. ^ Valente, Enza Maria; Bentivoglio, Anna Rita; Cassetta, Emanuele; Dixon, Peter H.; Davis, Mary B.; Ferraris, Alessandro; Ialongo, Tamara; Frontali, Marina; Wood, Nicholas W.; Albanese, Alberto (2001). "DYT13, a novel primary torsion dystonia locus, maps to chromosome 1p36.13-36.32 in an Italian family with cranial-cervical or upper limb onset". Annals of Neurology. 49 (3): 362–6. doi:10.1002/ana.73. PMID 11261511. ^ Grimes, D. A.; Han, F.; Lang, A. E.; St. George-Hyssop, P.; Racacho, L.; Bulman, D. E. (2002). "A novel locus for inherited myoclonus-dystonia on 18p11". Neurology. 59 (8): 1183–6. doi:10.1212/WNL.59.8.1183. PMID 12391345. ^ Chouery, E.; Kfoury, J.; Delague, V.; Jalkh, N.; Bejjani, P.; Serre, J. L.; Mégarbané, A. (2008). "A novel locus for autosomal recessive primary torsion dystonia (DYT17) maps to 20p11.22–q13.12". Neurogenetics. 9 (4): 287–93. doi:10.1007/s10048-008-0142-4. PMID 18688663. ^ Charlesworth, Gavin; Plagnol, Vincent; Holmström, Kira M.; Bras, Jose; Sheerin, Una-Marie; Preza, Elisavet; Rubio-Agusti, Ignacio; Ryten, Mina; Schneider, Susanne A.; Stamelou, Maria; Trabzuni, Daniah; Abramov, Andrey Y.; Bhatia, Kailash P.; Wood, Nicholas W. (2012). "Mutations in ANO3 Cause Dominant Craniocervical Dystonia: Ion Channel Implicated in Pathogenesis". The American Journal of Human Genetics. 91 (6): 1041–50. doi:10.1016/j.ajhg.2012.10.024. PMC 3516598. PMID 23200863. ^ Cassim, F (October 2003). "Les dystonies myocloniques" [Myoclonic dystonia]. Revue Neurologique (in French). 159 (10 Pt 1): 892–9. PMID 14615678. ^ Vidailhet, M.; Tassin, J.; Durif, F.; Nivelon-Chevallier, A.; Agid, Y.; Brice, A.; Durr, A. (2001). "A major locus for several phenotypes of myoclonus-dystonia on chromosome 7q". Neurology. 56 (9): 1213–6. doi:10.1212/WNL.56.9.1213. PMID 11342690. ^ Fuchs, Tania; Ozelius, Laurie J. (2013). "Genetics in Dystonia: An Update". Current Neurology and Neuroscience Reports. 13 (12): 10.1007/s11910–013–0410–z. doi:10.1007/s11910-013-0410-z. PMC 3877920. PMID 24136457. ^ Baker, Matt; Strongosky, Audrey J.; Sanchez-Contreras, Monica Y.; Yang, Shan; Ferguson, Will; Calne, Donald B.; Calne, Susan; Stoessl, A. Jon; Allanson, Judith E.; Broderick, Daniel F.; Hutton, Michael L.; Dickson, Dennis W.; Ross, Owen A.; Wszolek, Zbigniew K.; Rademakers, Rosa (2013). "SLC20A2 and THAP1 deletion in familial basal ganglia calcification with dystonia". Neurogenetics. 15 (1): 23–30. doi:10.1007/s10048-013-0378-5. PMC 3969760. PMID 24135862. ^ Burda, A; Webster, K; Leikin, J. B.; Chan, S. B.; Stokes, K. A. (1999). "Nefazadone-induced acute dystonic reaction". Veterinary and Human Toxicology. 41 (5): 321–2. PMID 10509438. ^ a b Louis, Elan D.; Lee, Peter; Quinn, Lori; Marder, Karen (1999). "Dystonia in Huntington's disease: Prevalence and clinical characteristics". Movement Disorders. 14 (1): 95–101. doi:10.1002/1531-8257(199901)14:1<95::AID-MDS1016>3.0.CO;2-8. PMID 9918350. ^ Janavs, J. L; Aminoff, M. J (1998). "Dystonia and chorea in acquired systemic disorders". Journal of Neurology, Neurosurgery & Psychiatry. 65 (4): 436–45. doi:10.1136/jnnp.65.4.436. PMC 2170280. PMID 9771763. ^ a b Forrest, Michael D.; Wall, Mark J.; Press, Daniel A.; Feng, Jianfeng (2012). "The Sodium-Potassium Pump Controls the Intrinsic Firing of the Cerebellar Purkinje Neuron". PLoS ONE. 7 (12): e51169. Bibcode:2012PLoSO...751169F. doi:10.1371/journal.pone.0051169. PMC 3527461. PMID 23284664. ^ Forrest, Michael D. (2014). "The sodium-potassium pump is an information processing element in brain computation". Frontiers in Physiology. 5: 472. doi:10.3389/fphys.2014.00472. PMC 4274886. PMID 25566080. ^ Calderon, D Paola; Fremont, Rachel; Kraenzlin, Franca; Khodakhah, Kamran (2011). "The neural substrates of rapid-onset Dystonia-Parkinsonism". Nature Neuroscience. 14 (3): 357–65. doi:10.1038/nn.2753. PMC 3430603. PMID 21297628. ^ Cannon, Stephen C (2004). "Paying the Price at the Pump". Neuron. 43 (2): 153–4. doi:10.1016/j.neuron.2004.07.002. PMID 15260948. ^ Filip, Pavel; Lungu, Ovidiu V.; Bareš, Martin (2013). "Dystonia and the cerebellum: A new field of interest in movement disorders?". Clinical Neurophysiology. 124 (7): 1269–76. doi:10.1016/j.clinph.2013.01.003. PMID 23422326. ^ Ray Lannom Watts; William C. Koller (2004). Movement disorders: neurologic principles & practice. McGraw-Hill Professional. pp. 502–. ISBN 978-0-07-137496-5. Retrieved 30 May 2011. ^ Jahanshahi M (2000). "Factors that ameliorate or aggravate spasmodic torticollis". J. Neurol. Neurosurg. Psychiatry. 68 (2): 227–9. doi:10.1136/jnnp.68.2.227. PMC 1736788. PMID 10644795. ^ "Dystonia: Treatment - MayoClinic.com". Archived from the original on 2 June 2007. Retrieved 7 June 2007. ^ a b Crowner, B. E (2007). "Cervical Dystonia: Disease Profile and Clinical Management". Physical Therapy. 87 (11): 1511–26. doi:10.2522/ptj.20060272. PMID 17878433. ^ a b Lubarr, Naomi; Bressman, Susan (2011). "Treatment of Generalized Dystonia". Current Treatment Options in Neurology. 13 (3): 274–89. doi:10.1007/s11940-011-0122-0. PMID 21455718. ^ a b c Myers, K.J. ; Bour, B. (2009). "The Role of Physical Therapy in the Management of Dystonia". In Okun, M.S. (ed.). The Dystonia Patient: A Guide to Practical Management. New York: Demos Medical. pp. 117–48. ISBN 978-1-933864-62-4. OCLC 429666586. ^ Priori, A.; Pesenti, A.; Cappellari, A.; Scarlato, G.; Barbieri, S. (2001). "Limb immobilization for the treatment of focal occupational dystonia". Neurology. 57 (3): 405–9. doi:10.1212/WNL.57.3.405. PMID 11502904. ^ Zetterberg, Lena; Halvorsen, Kjartan; Färnstrand, Catarina; Aquilonius, Sten-Magnus; Lindmark, Birgitta (2009). "Physiotherapy in cervical dystonia: Six experimental single-case studies". Physiotherapy Theory and Practice. 24 (4): 275–90. doi:10.1080/09593980701884816. PMID 18574753. ^ Jankovic, Joseph; Tolosa, Eduardo (2007). Parkinson's Disease & Movement Disorders (5th ed.). Philadelphia: Lippincott Williams & Wilkins. pp. 349–50. ISBN 978-0-7817-7881-7. ^ Brin, M. F.; Lew, M. F.; Adler, C. H.; Comella, C. L.; Factor, S. A.; Jankovic, J.; O'Brien, C.; Murray, J. J.; Wallace, J. D.; Willmer-Hulme, A.; Koller, M. (1999). "Safety and efficacy of Neuro Bloc (botulinum toxin type B) in type A-resistant cervical dystonia". Neurology. 53 (7): 1431–8. doi:10.1212/WNL.53.7.1431. PMID 10534247. ^ Bittar, Richard G.; Yianni, John; Wang, Shouyan; Liu, Xuguang; Nandi, Dipankar; Joint, Carole; Scott, Richard; Bain, Peter G.; Gregory, Ralph; Stein, John; Aziz, Tipu Z. (2005). "Deep brain stimulation for generalised dystonia and spasmodic torticollis". Journal of Clinical Neuroscience. 12 (1): 12–6. doi:10.1016/j.jocn.2004.03.025. PMID 15639404. ^ Foncke, E.M.J. ; Schuurman, P. R.; Speelman, J. D. (2006). "Suicide after deep brain stimulation of the internal globus pallidus for dystonia". Neurology. 66 (1): 142–3. doi:10.1212/01.wnl.0000191328.05752.e2. PMID 16401868. ^ Tarsy, Daniel; Simon, David K. (2006). "Dystonia". New England Journal of Medicine. 355 (8): 818–29. doi:10.1056/NEJMra055549. PMID 16928997.